According to Chargaff’s rule, the concentration of guanine always equalled the concentration of cytosine. The amount of purine = The amount of pyramidine in a given DNA molecule. 2. In humans, there is approximately 30% adenine. What is the percentage of other nitrogenous bases? Here [A]=30% therefore % of [T] is also 30%. therefore [G]+[C]=100 - 60 = 40 %. 3. In a DNA sample, the percentage of adenine is 40% and percentage of thymine is 60%. What is your inference? According to Chargaff’s rule, Concentration of adenine=concentration of thymine. therefore if [A]=40% then the [T] will also be 40%. But this rule rule is applicable only for double stranded DNA molecule. The possibility of Adenine=40% and Thymine=60% is only in single stranded DNA molecule. 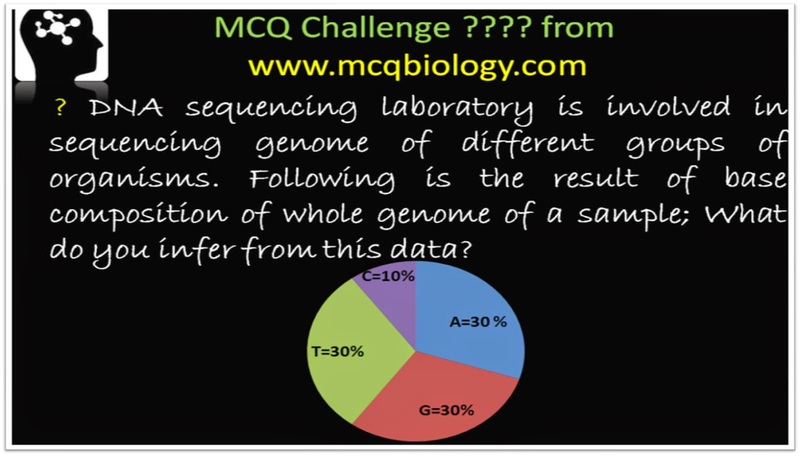 In the question, the DNA sample referred is a single stranded DNA. If guanine=10% as guanine will always pair with cytosine, i.e.cytosine is also 10% then adenine and thymine accounts 80% as adenine will always pair with thymine. 5. If the ratio (A+G)/(T+C) in one strand of DNA is 0.7, what is the same ratio in complementary strand. ?